Department Of Homeland Security Releases Plan To Reunify Families Administration officials unveiled the plan to reunify families separated under the Trump administration's zero-tolerance policy, but offered few details on how and when reunifications would happen. 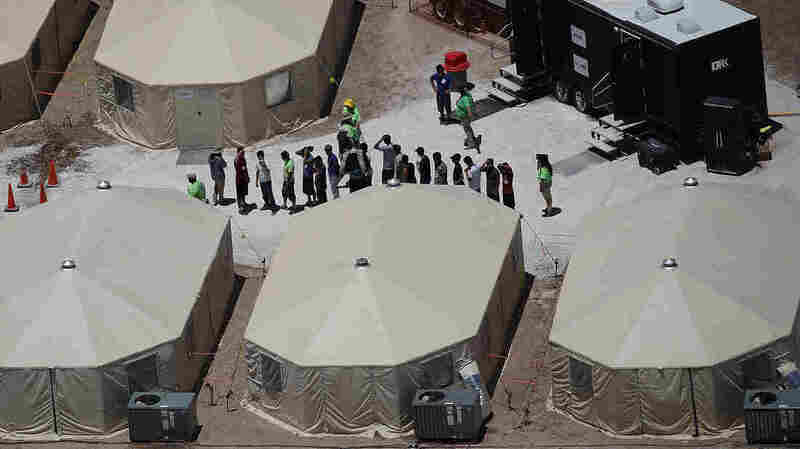 Children and workers are seen at a tent encampment on June 19, 2018 in Tornillo, Texas. The Trump administration is using the tent facility to house immigrant children separated from their parents. The Trump administration has released its plan for reuniting children who have been separated from their parents as a result of the president's "zero tolerance" immigration policy, but in a fact sheet issued on Saturday, it provided no timeline for when those reunifications will happen. According to the fact sheet, the Department of Health and Human Services has 2,053 separated minors in HHS-funded facilities "and is working with relevant agency partners to foster communications and work towards reuniting every minor and every parent or guardian via well-established reunification processes." "The United States government knows the location of all children in its custody and is working to reunite them with their families," according to the Department of Homeland Security, which says 522 children that were in the custody of U.S. Customs and Border Protection have already been reunited with their families. DHS says the process of reunification is "well-coordinated," noting that Customs and Border Protection, Immigration and Customs Enforcement (ICE), HHS and the Office of Refugee Resettlement (ORR) are working together on the reunification process. ICE is posting notices in its facilities telling parents that are trying to locate their children to call 1-800-203-7001. However many parents have reported that when they try to call that number, they have either been unable to get through, or were told they will receive a call back. Some have also reported not being able to make phone calls easily from the detention facilities where they are being held, further complicating the process of trying to reach their children, many of whom are being shuttled through shelters thousands of miles away. Immigration attorneys also say many of the separated families are applying for asylum, a process which can take several months. DHS has not provided a detailed plan for how and when asylum seekers will be reunified. The statement from DHS came three days after President Trump signed an executive order halting the practice of family separation, and ahead of a planned vote on comprehensive immigration legislation this week in the House. On Sunday, in a pair of tweets, Trump signaled he would like to do away with due process for immigrants who entered into the U.S. illegally. "We cannot allow all of these people to invade our Country," Trump wrote. "When somebody comes in, we must immediately, with no Judges or Court Cases, bring them back from where they came. Our system is a mockery to good immigration policy and Law and Order. Most children come without parents." The president continued in a second tweet, "Our Immigration policy, laughed at all over the world, is very unfair to all of those people who have gone through the system legally and are waiting on line for years! Immigration must be based on merit — we need people who will help to Make America Great Again!" On Sunday, the ACLU released a statement condemning the president's tweets. "What President Trump has suggested here is both illegal and unconstitutional," Omar Jadwat, director of the ACLU's Immigrants Rights Project, said in the statement. "Any official who has sworn an oath to uphold the Constitution and laws should disavow it unequivocally."